When talking sushi in regards to the “Little Tokyo” section of downtown Los Angeles, there are three big names when it comes to sushi: next-door neighbors Hama Sushi and Restaurant Komasa, and Sushi Gen (Sushi Go 55 is always worth shouting out, although the few times I’ve eaten there have been very hit-or-miss). Having eaten at all three at one point or another, I can say that they all have a very old-school, traditional vibe, from the discipline of the employees and chefs to the lack of over-the-top rolls and gimmicky sauces (though you’ll still be able to order a California or spicy tuna roll without feeling embarrassed). And while all three serve good quality, well-prepared sushi at rather reasonable prices, a meal at Sushi Gen always manages to leave a lasting impression on my palate that the other two can’t seem to match. 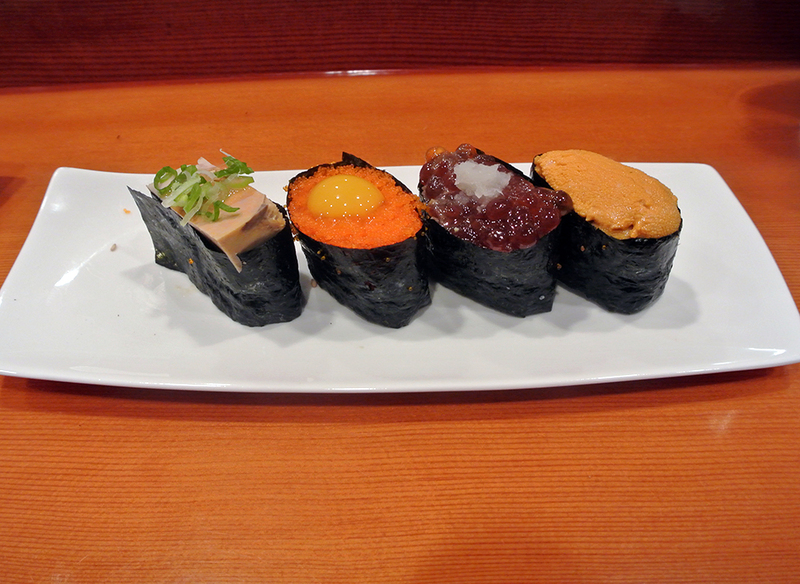 Established in the 1980s, Sushi Gen is one of the city’s longest-operating sushi bars (Sushi Go 55 may be the oldest) as well as one of the most popular judging from the line that forms outside before every lunch and dinner service. At lunch, most of the people waiting in line are there for the $15 sashimi plate (table-service only), a heaping platter of various raw and cooked fish that is by far one of the best bargains in town. Come dinner time though, the sushi bar is the place to be, with omakase the only way to get the full Sushi Gen experience. I’ve never had a disappointing time sitting at the bar at Gen, but the best, most memorable visits have always occurred while sitting in front of Taka-san. Building a relationship with your sushi chef is no different than one with your barber or mechanic; when there is a mutual level of respect and trust than the interaction proves more profitable for both parties involved. When I check in at the podium at Sushi Gen, the guys in charge know that I only want to sit in front of Taka-san, passing up open seats and enduring a longer wait if need be. The reason why I insist on sitting in front of him is that a level of trust has developed between us; he knows that I will eagerly try whatever he serves me, be it cured salmon eggs still in the sac or oddly-textured sea cucumber, and I know that he will charge me a fair price for the quality of the meal. If I don’t like something he may leave it off the bill, but when I make a comment about loving the textural interplay between the chopped toro and takuwan (pickled daikon radish) that he served me, I can be sure that he’ll remember to make it again for me on my next visit. 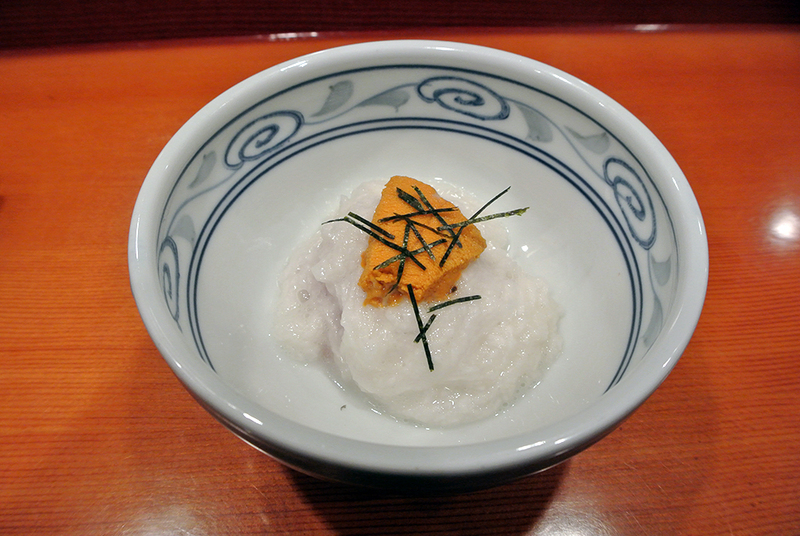 Taka-san began the omakase with a rather unusual dish featuring the mucilaginous grated yam, a surprisingly clean tasting, if not goopy, starch that topped with a cool piece of uni. I was instructed to add a touch of soy sauce and mix with my chopsticks, only to reveal tiny bites of toro hiding beneath the white mass. It was incredibly clean tasting and refreshing on the palate, with the salt from the soy sauce bringing out the flavor of the toro. 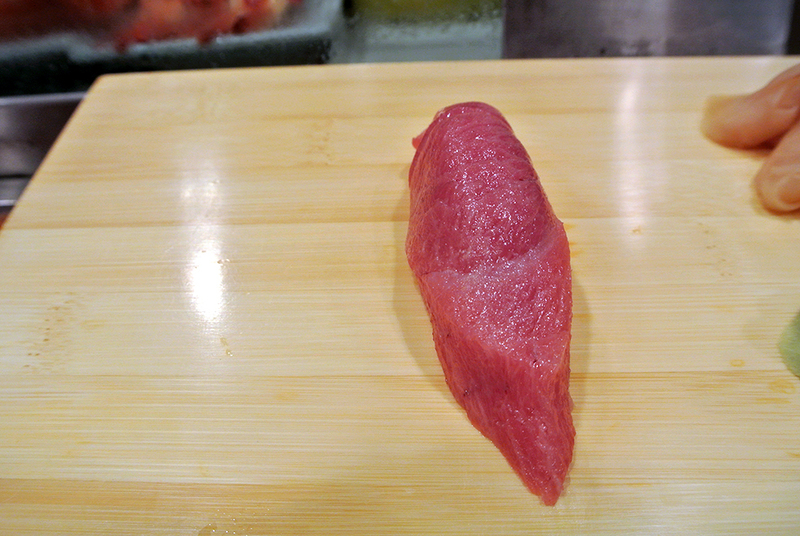 First up was a beautiful reddish-pink slice of toro. 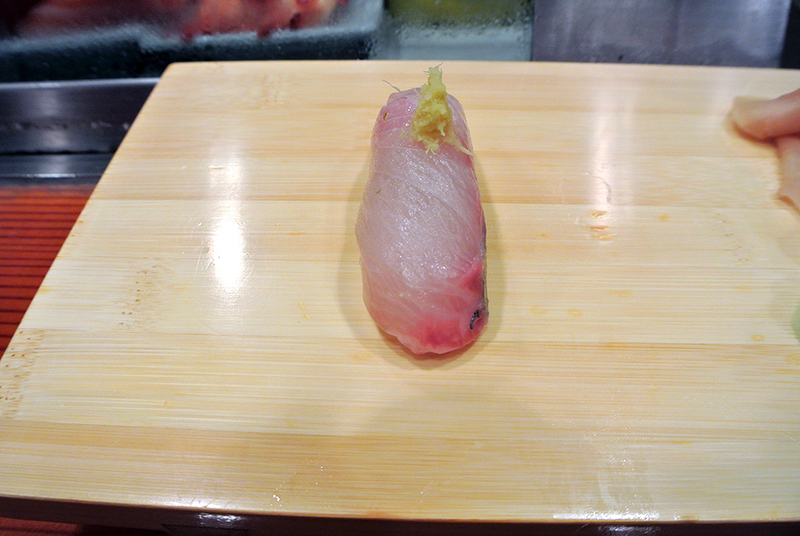 This was of the “medium” variety, not uber-fatty but still possessing that desirable tuna taste. Aji arrived with some freshly grated ginger on top. Texturally it was somewhat reminiscent of yellowtail, while the fishy oiliness of mackerel was present towards the tail end. Snapper can be a rather mild tasting fish, but here it was livened up by the application of some fresh acidity, salt, and a dot of yuzukosho. Very fresh tasting while the flesh possessed a pleasing chew. 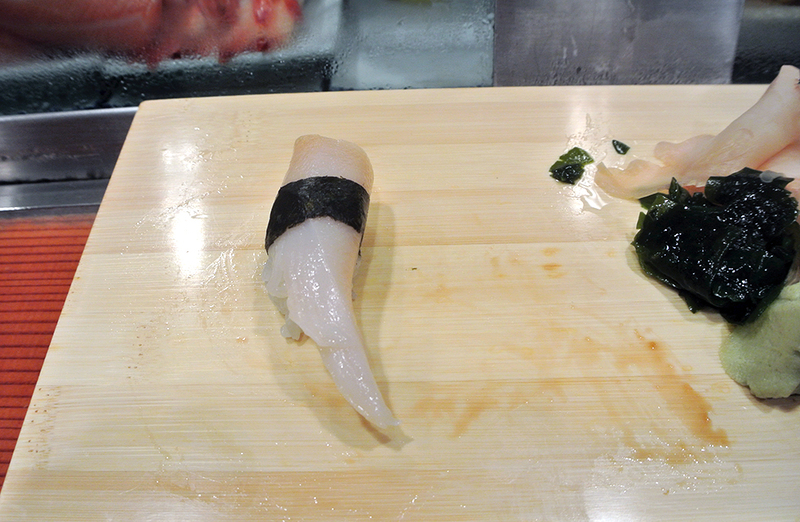 Starting from the left, an incredibly soft piece of albacore that required very minimal chewing. The grated ginger on top went well with the subtle sweetness of the fish. 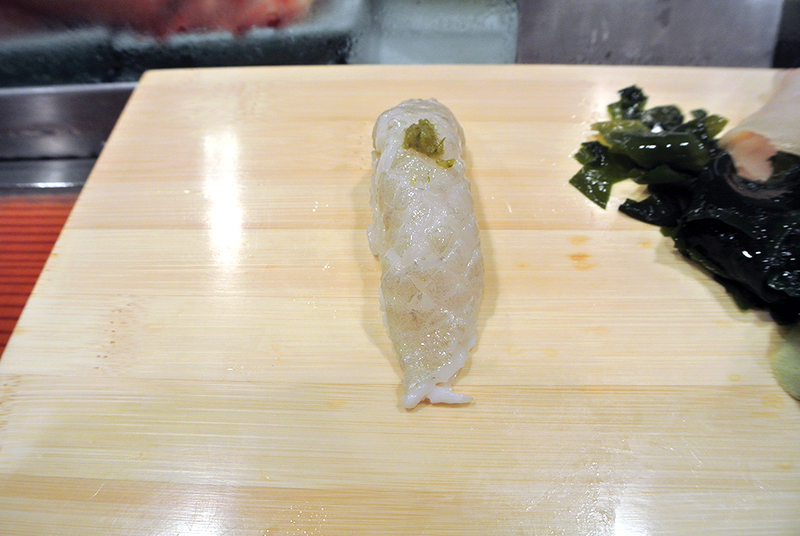 In the middle was a translucent slice of halibut, with the momiji oroshi delivering a tinge of heat and the scallions lending some background texture. 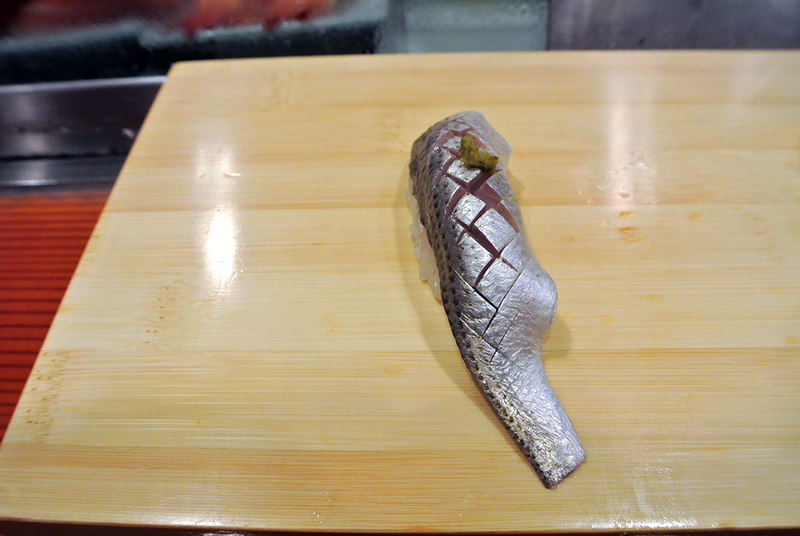 On the end, a lovely pink-fleshed Spanish mackerel topped with slivers of shallot; noticeably less oily than its cousin saba. I started with a beige rectangle of monkfish liver. It wasn’t quite as soft as other versions I’ve had, but was perked up by some well-placed scallions and a light miso sauce. Next up was masago, where the faint pop of the tiny eggs was complimented by the creamy quail egg yolk floating on top that delivered a lush finish. Marinated salmon roe was a real treat. The eggs (still in sac) are covered in a mix of sake and miso and left to cure for 2-3 months. The resulting flavors were deep and dark; it was slightly sweet from the alcohol, had very little brininess, and conveyed a hearty, almost warming quality that was fitting for the chilly evening. The uni tonight was solid. 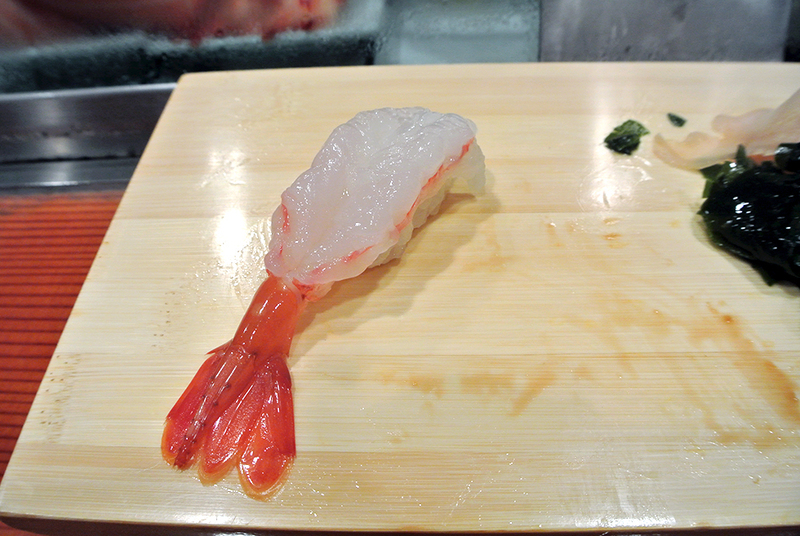 I liked that it wasn’t served too cold, as it revealed much more of an ocean flavor via its velvety texture. 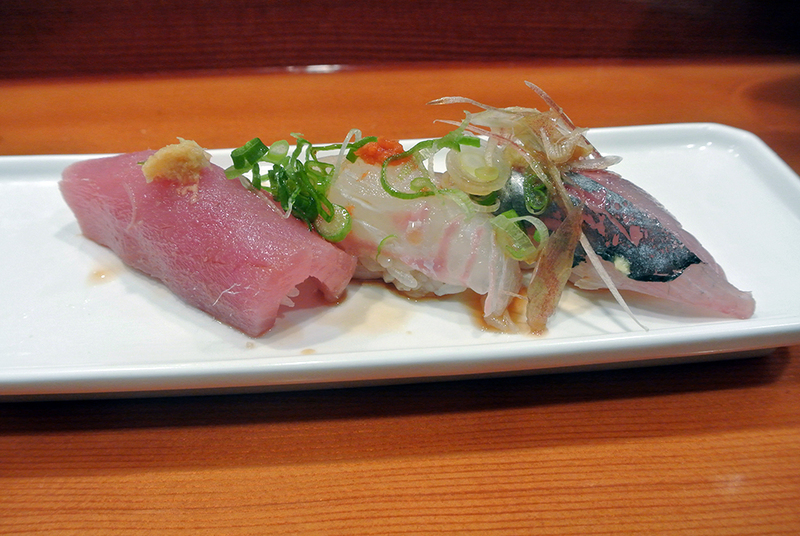 Kohada has long been a favorite of mine, its vinegary cure and sardine-like fishy undertones resulting in a strong-flavored bite. Here, it was countered by a touch of peppery yuzukosho. 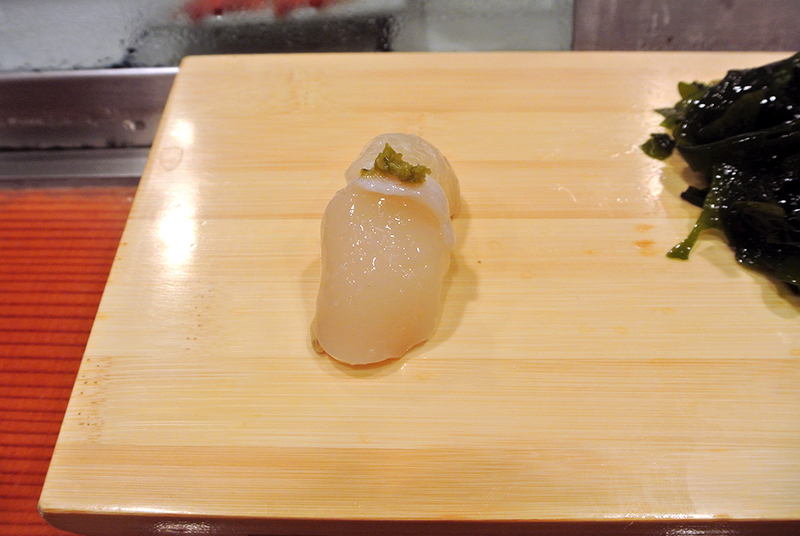 I can’t recall ever encountering a scallop that I didn’t enjoy, and this was no exception; cold, soft, and slightly sweet, with the yuzu-pepper paste delivering a zing on the finish. 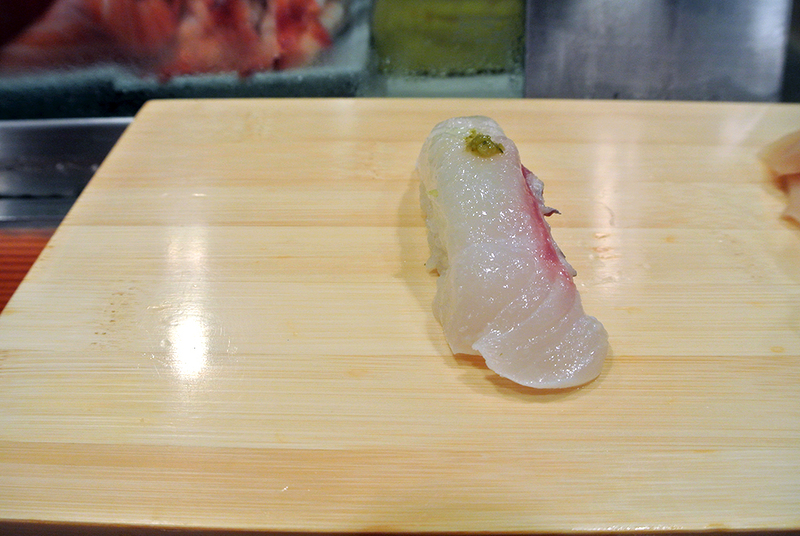 Engawa has become one of my favorite sushi items over the last year because of its unique consistency, which was elevated here courtesy of a quick sear before serving. Anago was spot-on tonight: warm and meaty, with the key being that it wasn’t overly-sauced (I generally prefer sea eel to be without any sauce, but it worked well here). 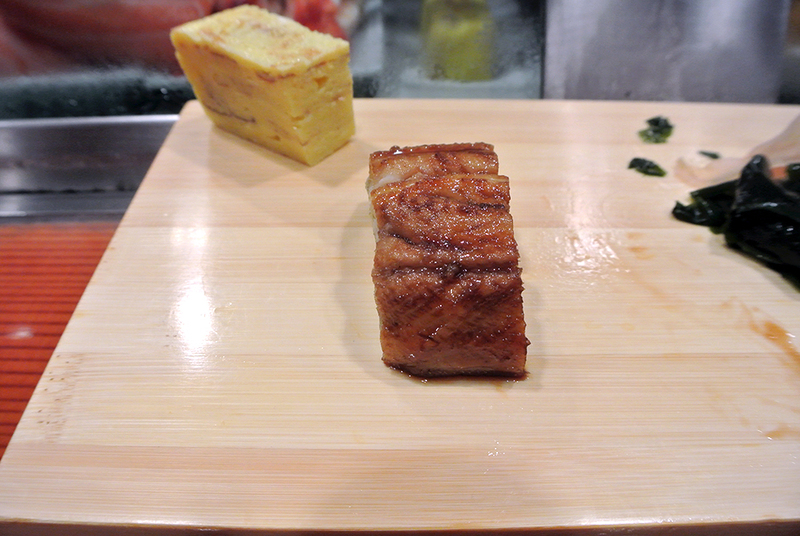 The presence of tamago signaled the end of the omakase. It displayed a soft consistency with a taste that was just a touch more savory than sweet. Not quite full, I went ahead and ordered two additional items. 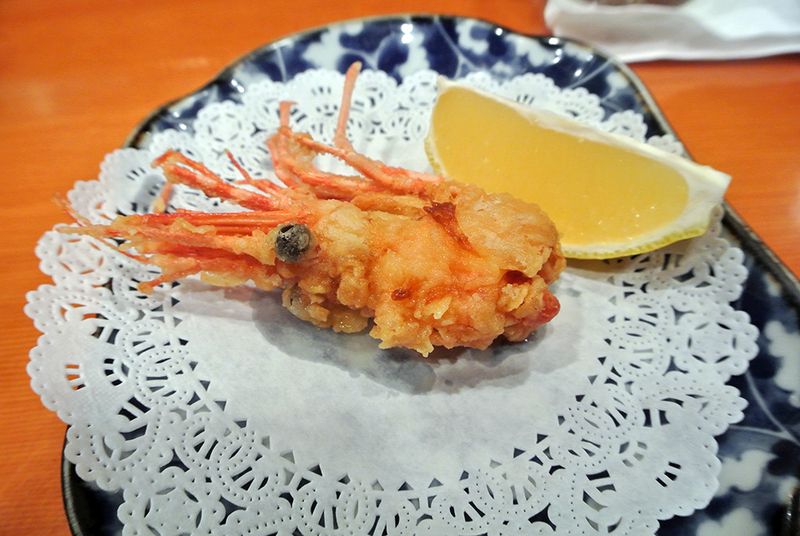 The first was amaebi, or spot prawn served in raw fashion with nothing but a dab of wasabi on the underside. Though I’ve known the texture to be off-putting for some, there’s no denying the very clean and pure taste of the crustacean. The head arrived shortly after in fried fashion; a squeeze of lemon was all that was needed before crunching into the hot, meaty innards. Mirugai was the final piece of the evening, crunchy to the bite and imbued with a strong ocean essence that lingered briefly on the tongue. Eighteen pieces later and my stomach was pleasantly stuffed, although my wallet was noticeably slimmer. Omakase with Taka-san at the helm never disappoints, as he sliced and served me personal favorites like jack mackerel, halibut fin and gizzard shad, proven winners like toro, uni, and scallop, as well as mixing in two new items with the sea urchin-grated yam-fatty tuna starter and the wonderful sujiko. Sushi Gen may not be the ideal choice for aficionados seeking a more varied and obscure selection of raw fish, but for everyone else in search of always fresh, high quality sushi, there’s nowhere else I’d recommend, especially if you snag a seat in front of Taka-san and put your faith in his hands.